By Georgia Cheer. Diana Whittome does not breed pure Crabbet; instead her lines are predominantly Crabbet/Old English, with a dash of Polish, Egyptian or Russian. Her emphasis is to breed performance horses and she has done this exceedingly well. 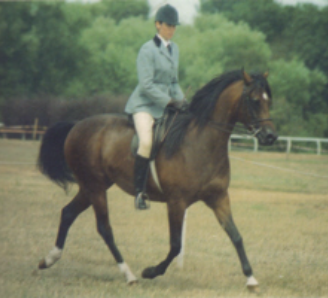 Diana is also a show judge, plus she holds several committee positions on the Arab Horse Society council. She writes articles for the AHS News and other publications and is delightfully entertaining and extremely knowledgeable on pedigrees.